Are you wondering if Pinterest can help your business? Do you want to get more traffic from your Pinterest account? To learn more about the power of Pinterest for marketers, I interview Beth Hayden for this episode of the Social Media Marketing podcast. In this episode, I interview Beth Hayden, author of the new book Pinfluence: The Complete Guide to Marketing Your Business on Pinterest. 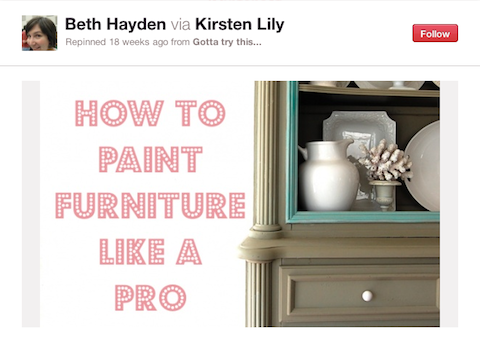 Beth shares her insights into how Pinterest can drive more traffic to your website or blog. You’ll learn tips and techniques on what images work best on Pinterest and why content behind the image matters. Beth talks about the demographics of Pinterest users. The latest number of Pinterest users is about 11 million. Up to 80% of Pinterest users are women between the ages of 25 and 55. Beth says that the demographic is shifting and there are more men joining. Pinterest users are fairly affluent, with a salary of $50,000+. 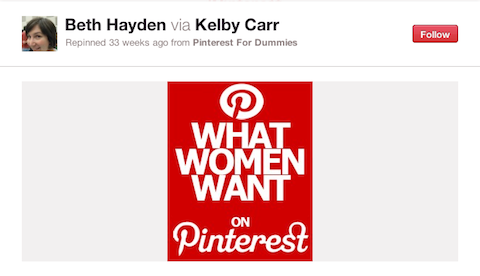 80% of Pinterest users are currently female, but more men are joining so the demographic could change in the future. Discover Beth’s theory behind the success of Pinterest and why there’s something addictive about it. Listen to the show to find out more about Pinterest and how it draws you in. Beth shares how Pinterest is a great source of referral traffic for websites and blogs, even when compared to other social media sites. At present, Pinterest is driving more referral traffic than LinkedIn, Google+ and YouTube combined. And the only social media site driving more traffic than Pinterest is Facebook. You’ll learn how Pinterest can drive referral traffic back to your blog or website as Beth goes through all of the steps involved. You’ll discover what makes Pinterest different from Twitter, Instagram and Facebook. The secret is in Pinterest’s simple model of videos and images on boards that are linked back elsewhere. Listen to the show to understand how this visual billboard platform can work for you. What social actions happen on Pinterest. On Pinterest there are three action buttons: Repin, Like and Comment. Visitors can choose to repin, like and comment on the images shared on Pinterest. Beth explains the importance of repinning—how every time something is repinned, it’s shared with the person’s followers—and how this becomes exponential. You’ll also discover what works best on Pinterest between liking, repinning and commenting on pins and the reasons why they are different. Beth shares why she believes that people should take more advantage of commenting on pins. It’s an opportunity for marketers to create more engagement. Listen to the show to learn how to get more out of your Pinterest marketing. Beth explains how pinboards are collections of images and videos. Beth describes the process as creating a collage out of images that you cut from magazines. The pinboard is the heart of Pinterest. 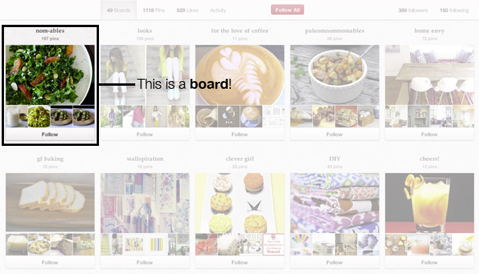 Beth suggests making your boards as specific as you can. For example, instead of having a generic recipe board, you need to be more specific and maybe break it out into entrée recipes or dessert recipes. The more specific you are, the easier it is for people to see your interests. Listen to the show to hear why the pinboard is the heart of Pinterest and what the two key pieces are. How to build a following. Beth believes that a following on Pinterest is as important as a following on any other social media site. Building a following on Pinterest can take more time than on other social media sites, even if you are fairly active. You should consider quality over quantity because you want to have an engaged audience that really likes what you are sharing. The better your content is, the quicker and better you will build your audience. You need to be a content curator on Pinterest. Listen to the show to find out how to become the “go-to” person on Pinterest. Beth explains how Pinterest can help build your email list. First you’ll need to make sure the traffic from Pinterest goes back to your website or blog. Then the best way to get them onto your email list is to have a prominent opt-in form on your website or blog. Place a big opt-in form on your website or blog to make it easy for visitors to get on your email list. 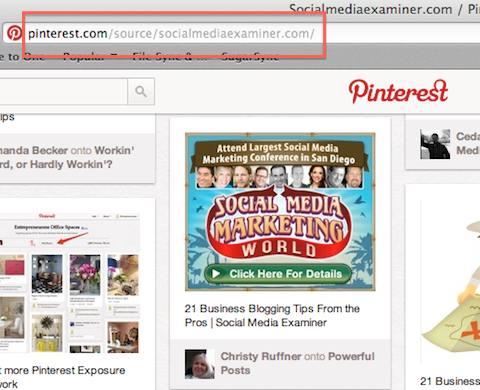 In your Pinterest profile you have an opportunity to put a link to your website. Make sure it goes back to a landing page, where your visitors can get free products in exchange for their email address. Remember, on Pinterest you can also market your webinars and conduct other list-building activities. Listen to the show to hear why Pinterest is ideal for service businesses. What are the best images to share? You’ll find out what size images or video work best on Pinterest. The maximum width you can use for images on Pinterest is 554 pixels. And you’ll also learn why very tall images should be avoided. They tend not to work well, because once someone scrolls all the way to the bottom of the image, they are less likely to scroll all the way back up to repin it. So if you have a long infographic, make sure you have a shorter version that is more pinnable, then link the smaller version to the full infographic on your website. Use a short screenshot of a long infographic and link back to the full version of the infographic. Some images are more compelling than others. The type of pictures that get repinned are often gorgeous travel photos, great-looking recipes and practical “how to” content. You’ll sometimes find that even though the picture isn’t visually pleasing, it’s the content behind that people are really interested in. One of Beth’s favorite tricks on Pinterest is what she calls “photo badges” where you can take an image and put text on top of the image to describe content behind the link. A great example of a photo badge that is highly pinnable! This image has driven thousands of visitors to Nester Smith's blog, thenester.com. Although Pinterest shows you how many times your pin has been pinned or liked, it doesn’t show you which pin is sending traffic to your site. To find this out, you need to track it on your website or use Google Analytics. Google Analytics is great for finding out which individual pin is sending traffic to your website or blog. How to enable a website or blog for Pinterest. It’s important to have a Pin It button on every page of your website or blog to make it easy for people to share your content on Pinterest. Once your content is on Pinterest, others will be able to repin your images. As these images are shared across Pinterest, you’ll get more links back to your website. Beth explains the importance of making sure the images on your website are pinnable. Some visuals are not pinnable, such as Flash banners. If you want to be sure your visual images are pinnable, try to pin them to your own Pinterest account. And if you have a Pinterest account, make sure the Pinterest icon is together with your other social media icons wherever you publish them. Listen to the show to hear more about the Goodies section on the Pinterest About page. How #hashtags help with visibility in search. Beth explains how hashtags and Pinterest work the same way—but they don’t work quite as well—as they do on Twitter. You can enter a hashtag into the Pinterest search box in the top left corner of the site. This pulls up the pins with either the whole #hashtag or the words searched for. At present this seems to only pull in recent pins. Listen to the show to find out why Pinterest hashtags aren’t great for SEO. You’ll find out how you can search Pinterest to find out what people are already pinning from your website or blog. Go to the URL field in your browser and put in pinterest.com/source/yourwebsite.com. Pinterest searches of all of its images and pulls up everything from the domain that has been pinned by users. You’ll discover what others are pinning from your website, who’s pinning it and the description on it. Go to pinterest.com/source/yourwebsite.com to discover what content people are sharing on Pinterest. Whether you are just starting out or have been on Pinterest for a while, take a look to see what content is taking off with pinners. It’s super-valuable and you will be surprised. Listen to the show to learn how checking out this tip can help you discover what images are working. If you have a blog or a website with lots of images that you think people would want to share on Pinterest, then this Pinterest plugin by Phil Derksen is the tool that you’ll want to use. This WordPress plugin has a free version and a paid version. It allows users to select from your article an entire array of images. 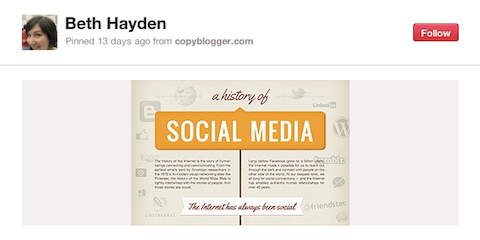 All of the images in your blog will show up in a cool interface from which users can then choose and pin on Pinterest. This tool can also show the number of times an images has been pinned. 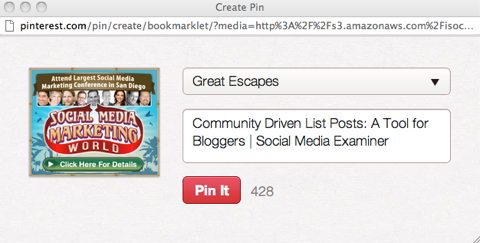 The Pinterest plugin allows users to share images from your website through their pinboards. Listen to the show to learn more and let us know how these work for you. What do you think? What are your thoughts on Pinterest as a marketing tool? Please leave your comments below.